The Washington Post quotes Sen. Chuck Schumer of New York, the brains behind the Democrats’ new Senate majority, as saying of Senator [Jim] Webb, “He’s not a typical politician. He really has deep convictions.” Which perhaps reveals less about Webb than about the other 50 Senate Democrats. Thanks to James Taranto’s Best of the Web for this scrumptious tidbit. MSM at long last takes note here. Michelle Malkin has been all over this for days. Here’s one of more notorious examples when CNN took insurgent tape or a sniper and showed it on TV. This while they stay in their hotel rooms and file “their” reports. In other words, our media have thrown in with the Pallywood, Hezbollywood set. Apparently that does not constitute compromising their objectivity. City Anti War Resolution Passes 5-0…After Saltzman Shows Up for Meeting. Late. Again. 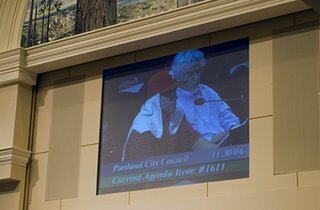 Portland City Council passes 5-0 resolution to pull troops from Iraq because they don’t like the war. Oh, and we need to pull out because there will be peace. 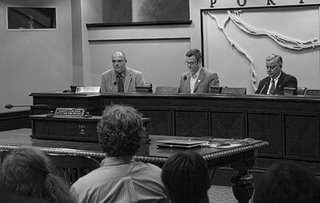 Here’s a copy of the resolution ghost written for Randy by the anti war folks. Thanks to Matthew for the following photos for the blog. You’re awesome. Kid with a tee shirt on his head testifies that recruiters are liars and he’s so glad he wasn’t forced to go into the military. He apparently wasn’t paying attention to the part about it being a volunteer army. ABC Goes to Duh.com for it’s Latest "EXCLUSIVE"
WASHINGTON, Nov. 30, 2006 — – U.S. officials say they have found smoking-gun evidence of Iranian support for terrorists in Iraq: brand-new weapons fresh from Iranian factories. According to a senior defense official, coalition forces have recently seized Iranian-made weapons and munitions that bear manufacturing dates in 2006. While the New York Times reported that as many as 2,000 Iraqi militia fighters had received training in Lebanon, one of the senior officials said he believed the number was “closer to 1,000.” Officials say a much smaller number of Hezbollah fighters have also traveled through Syria and into Iraq to provide training. U.S. intelligence officials believe the number of Al-Sadr’s Mahdi army now includes 40,000 fighters, making it an especially formidable force. IF YOU JUST WANT TO MAKE A QUIET STAND FOR THE DIGNITY OF THE US TROOPS FIGHTING TERRORISTS IN IRAQ.